If you are from anywhere near West Virginia or western Pennsylvania, chances are good that you’ve heard of (or eaten!) 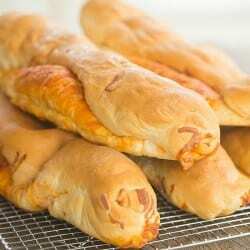 pepperoni bread (sometimes also called pepperoni rolls). It was pretty much a staple at my grandma’s house when I was a kid. Walking into her kitchen and seeing mounds of pepperoni bread stacked all over her counter was like Christmas morning. Needless to say, they didn’t last long at all at her house. What we didn’t devour while we were there was divvied up between my family and our cousins to eat at home. Words truly do not do justice to how absolutely, positively in love my family was with my grandma’s pepperoni bread. I also cannot tell you how utterly elated I was when I found out early on in our courtship that my Chief Culinary Consultant’s mom also made pepperoni bread. I’ve only made it a handful of times myself, so I’m always ecstatic when I find out that his mom is making a batch. Pepperoni bread was one of the earliest recipes ever posted here on Brown Eyed Baker, but it was terribly vague and in desperate need of a makeover. Any excuse to make pepperoni bread! My grandma (and my mother-in-law) used Rhodes frozen bread dough. I highly recommend it. I know. You could totally make your own dough. I have. It’s fine, but it’s not the same, and sometimes you just want what you’ve loved since you were four years old, right? When my grandma first told me how she made hers, she said she would get two rolls out of one loaf of bread dough. However, mine seemed to come out quite bigger than I remember hers. It doesn’t really matter, but if you’d prefer smaller rolls, you could certainly divide the dough into three or even four pieces. Feel free to adjust the amounts of pepperoni and cheese, and use more or less of either based on your personal preferences. You could also add/substitute other meats like salami or different cheeses (although in our family it’s straight pepperoni and mozzarella; I do make one roll with the addition of green olives for my Chief Culinary Consultant because he loves them). You will almost certainly find that some pepperoni and/or cheese spilled out of the side of some of your loaves. Embrace it. As kids, we used to fight over who would get the roll with all of the cheese stuck to the outside. I have yet to meet pepperoni bread without at least a little “seepage”. My family always kept these (and ate them) at room temperature, but my Chief Culinary Consultant’s family refrigerates them and reheats them. You could do either. If you have a pizza stone, you could bake the pepperoni bread on there, as they would get a crispier bottom, which I love (my grandma always made hers on VERY seasoned baking sheets). If you like pepperoni pizza, these will be right up your alley. It’s basically pizza without the sauce! I love the memory of seeing pepperoni bread in my grandma’s kitchen; I need to make them appear in mine more often! Looks delish, HOWEVER, the original pepperoni rolls/bread never had cheese. I grew up in WV. Many relatives, including my father, were coal miners, which is what these were created for in the 1920’s. I have never seen cheese in this simple delicious treat. Not homemade nor made in the town bakeries. I grew up in WV. High school lunch break meant a walk to the local bakery for pepperoni bread. I have not made it in years, now will have to give it a go. Thanks! This recipe is a snap using the frozen dough and great instructions. The flavor is wonderful. I could even imagine these sliced and served with a bowl of soup! Love the original recipe with the homemade dough. Seems to have disappeared from the site. Is it still available? 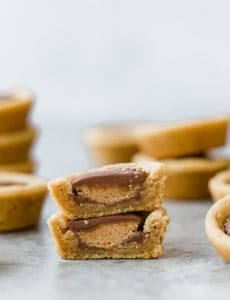 Do these need to do a second rise after you roll them up or do you just roll up and then immediately bake them? Thanks! Hi Kelly, No second rise needed, just roll and bake! 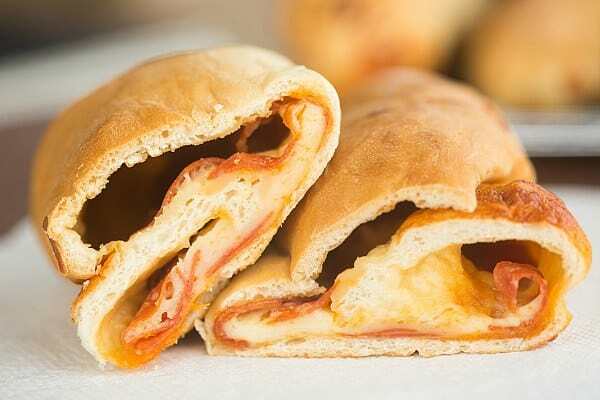 The original pepperoni rolls were made at the Country Club Bakery in Fairmont, WV in 1927 as a lunch option for the coal miners. If you are from WV you know they are called pepperoni rolls and not pepperoni bread. 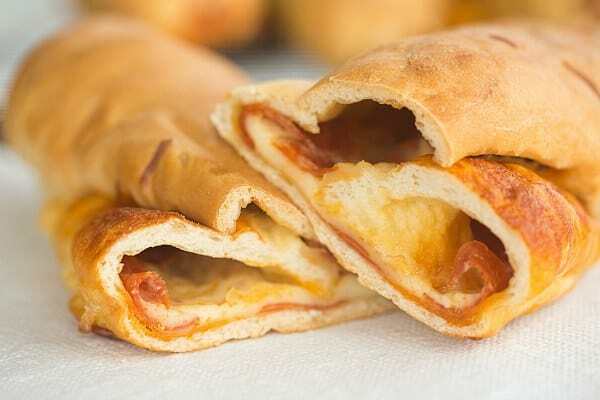 Most pepperoni rolls are plain, without cheese. They also used two pepperoni sticks that ran the the length of the roll. 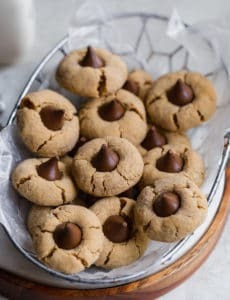 I’m from Fairmont, WV and grew up on them, getting them either from the Country Club Bakery or Colasessano’s in Fairmont. Thank you for sharing your family recipe. Brings back such fond memories. I wanted to make this recipe this evening. I have 2 rolls currently unthawing. I had a quick question. I am trying to get a good gauge on how many servings per pizza roll. I will be feeding 6 people tonight, 4 of which are teenagers. Originally I thought I would not split the loafs into 2 each, but that might be a better way to assure I am feeding the masses. Any direction would be great. Thank you. Hi Michelle! I think I would split them; in all honesty, if I’m hungry I could totally eat half of a roll myself, no problem. When we have these out for appetizers, they go super fast. So if you’re feeding teenagers, I’d split it into more rolls so everyone gets some :) You could also slice them into narrower pieces so it takes a little more time to go through each roll :) I hope that helps! These are absolutely delicious! The recipe is a keeper. My family loved them! 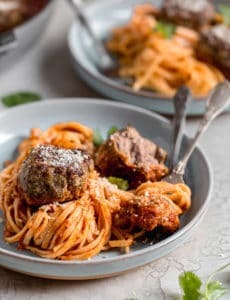 I ask because this looks like an awesome make ahead dinner to bring to our concert in the park when I am coming straight from work and won’t have time to pick up take out. I want to see if I have enough time to make it after work tonight to pack for tomorrow. (it won’t work if it takes like 3-4 hours to thaw and rise dough). Hi Jaime, The exact time will depend on the temperature and humidity of your kitchen, but it will likely take longer than 3-4 hours to thaw, rise, and assemble/bake. So sorry that won’t work for you! Nice Information .I think I would love this and my boyfriend most definitely too. I can’t believe how much Rhodes bread made a difference in this recipe. My husband and I grew up in western pa but have lived near DC for almost 16 years now and I started to make pep bread years ago because we so t get back home to often anymore. I just wish mine came out as airy as your recipe does, not sure what I’m doing differently. 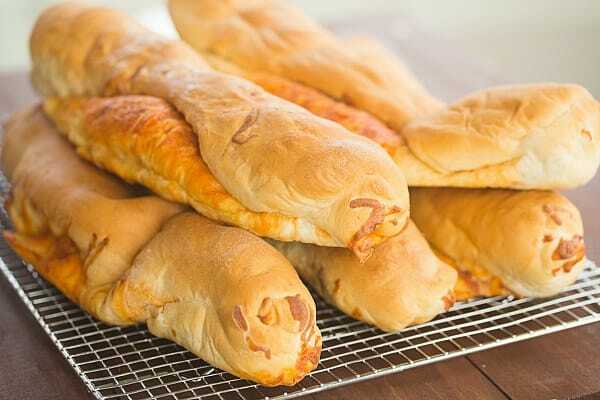 Around here a popular thing is also sausage bread — exact same concept using crumbled cooked Italian or breakfast sausage. I use way less cheese and usually throw in some sautéed peppers and onions even with a pepperoni bread. They’re all yummy! I love pepperoni bread. i live in North Carolina so hope I can find Rhodes bread! My husband’s WV/western PA family eats pepperoni bread often. I’d never heard of it until I married into the family. My MIL (and her now deceased mother) only put pepperoni in theirs. Love pepperoni bread no matter what! I haven’t tried to make it as I’d hate my husband to be disappointed. It’s a favorite snack that his Nanni used to make. I think I’ll leave his memory of this with her and let his mom carry on the tradition. 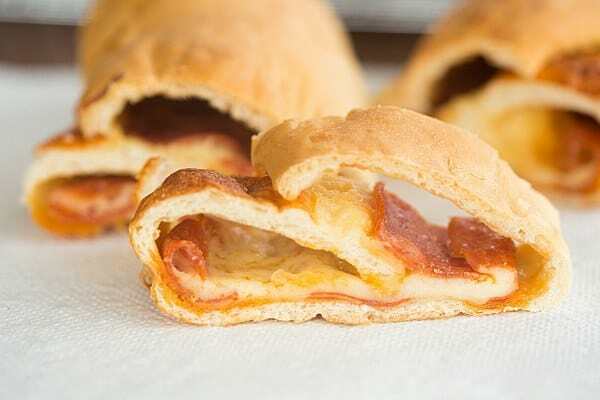 OMG these were just like home… I grew up in WV but left when I was 13 and I have really been wanting a pepperoni roll lately I live in NE now and have for the last 15 years and I can’t find them anywhere here. Ty so much for posting this! I have been making these for years especially at Christmas as gifts for friends. I add a couple extra ingredients –diced green peppers and cooked sweet sausage. We all look forward to them. 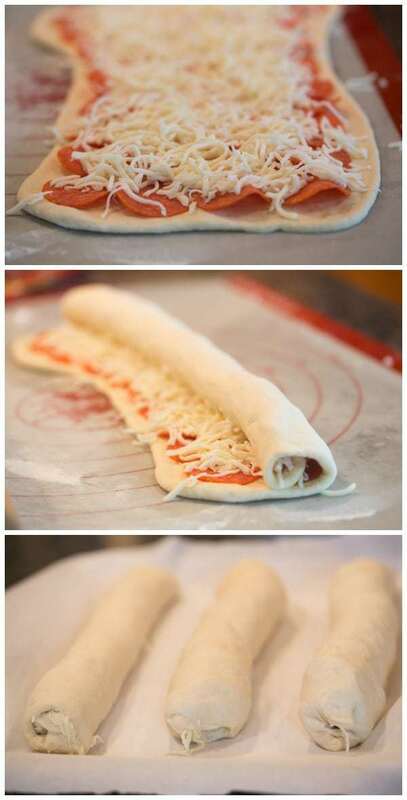 You can also use pizza dough OR bread dough. I’ve done both with equal success. I have made this recipe with Rhodes rolls delicious I brush the top with butter, garlic salt and oregano once cooked. Warmed pizza sauce on the side. My teenagers eat about 6 rolls each this bread will be a quicker version. Making your recipe today. Adults love these as much as kids. I so just pinned this & will be making it soon. We are huge lovers of pepperoni bread in this house!